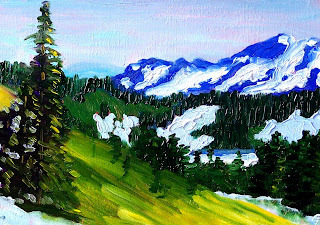 This little 5x7 inch oil painting is another of my Montana paintings. 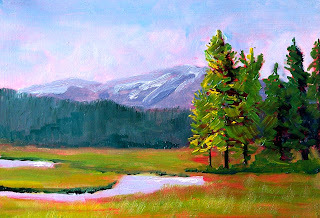 I used a red underpainting and love the warmth it brings to the mountains and the meadow. The grasses are turning brown as the season moves from the green of spring and early summer to the gold of late summer and fall. It is raining tonight. The day has been gray and ugly, but I'm spoiled because the summer has been lovely. In celebration of summer evenings, I'm listed this 5x7 inch oil painting in my Etsy shop, hoping for more sunny days. The painting SOLD quickly, so sunny days seem to have arrived in my heart if not in the weather. 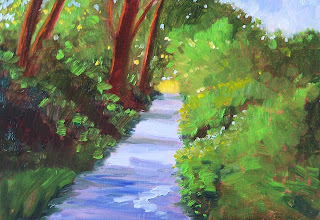 Additional landscape oil paintings are available for purchase here. Last week I went to the mountains, and now I'm getting an itch to go to the ocean. One thing that is wonderful about living in Western Washington State is that I can visit the mountains and within just a few hours be at the coast. 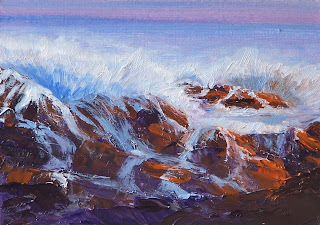 The North Jetty of Gray's Harbor in Washington State was the inspiration for this little 5x7 inch oil painting. It was created with a brush and a palette knife so has a lot of thick impasto (thick paint). I love the abstract quality of the water, the rocks, and the orange and purple paint. This morning I listed it at Etsy. You can purchase it for $50.00 plus $6.50 shipping to US addresses by clicking on this link. 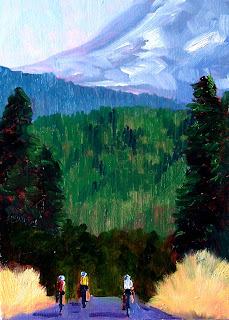 This 5x7 inch oil painting was inspired by the Trail of Shadows at Longmire in Mount Rainier National Park. The trail travels through a tall evergreen forest that encircles a sunny meadow. Bright sunlight creates the long shadows which gives the trail its name. Today's painting is a result of my trip to Mount Rainier yesterday. As I stood on the shoulder of the mountain and looked south, I was delighted with the view of the Cascade Mountains. The mountains and the foothilss where I stood were splashed with snow. It was amazing to see young wildflowers sprouting amidst the icy remainders of winter. This painting is a 5x7 inch oil painting. Today I visited Mount Rainier National Park and took numerous photos for future reference. This mountain in Washington State is one of my favorite subjects. I took some great pictures that will keep me busy painting for quite a whilte. It is amazing that late in July many of the trails are still clogged by snow. I hiked to Alta Vista at the 5900 foot level, but to go further, I needed better hiking boots, poles, and more time. In a few weeks the snow should be melted a little more and the wild flowers will be blooming. It is tempting to go back to this lovely spot. 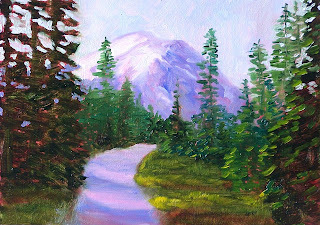 This oil painting of the mountain is 5x7 inches. I've been experimenting with different colors for the sky in my landscape paintings. 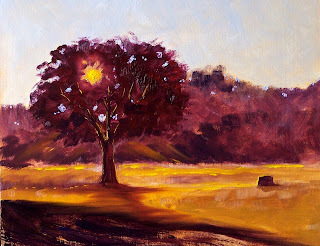 This 5x7 inch oil painting demonstrates what happens with a yellow sky. 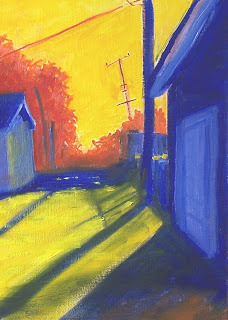 This is a painting of an alley that I have painted before, but last time I painted it, it was winter with piles of snow. This version depicts a hot summer evening. It is fun to see the effects of color choices on the mood of the painting. Here is the version I painted during the winter. The vantage point is slightly different. It is also a 5x7 inch painting. 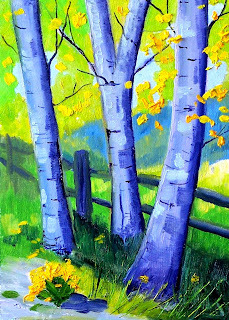 It was completed using acrylics and is an interesting comparison when you see what happens with a cool blue sky. This past weekend was the Sequim Lavender Festival. Sequim, Washington, on the Olympic Peninsula, is the lavender capitol of the United States and there is a festival each year in July to celebrate. The farms open for tours and everything in this little town seems to have something to do with lavender. Its wonderful scent is everywhere and even on a hot day, the fields produce a delightfully cool vision. 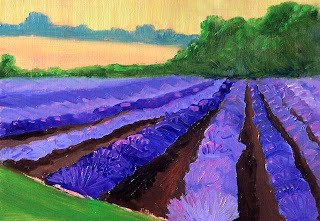 This little 5x7 inch oil painting was inspired by the Sequim Lavender Festival. 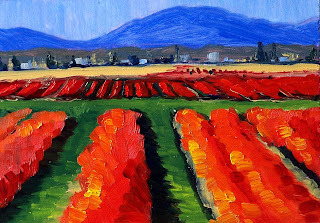 This week's Etsy listing is a small 5x7 inch oil painting I created last spring just as color was beginning to show in the fields of the Skagit Valley. The blueberry plants took on a bright red color and the sun warmed everything to a temperature not felt in months. 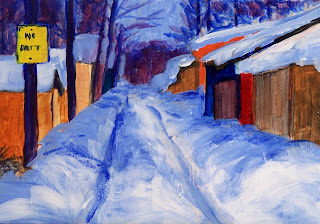 You can add this little painting to your collection of small format art for $50.00 plus $6.50 for shipping to US addresses by clicking here. If you want to see other paintings available from my collection you can click on the link to my shop here. Last week I bought a new bicycle, so today's painting had to have some cyclists in it. My imagination took me to this scene. I liked the contrast between the enormous mountain and the little riders. The painting is 5x7 inches in oil paint. I may paint a similar scene in the future as I refine this one for a larger painting. I've been reminiscing about a family vacation to Montana a couple of years ago. It is a beautiful state and I would love to visit again. However, with gas prices and other commitments this summer, it isn't going to happen this year. In the meantime, I will paint and think, "Maybe next year." 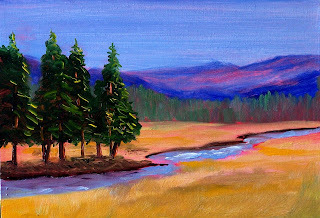 This painting of a Montana landscape is a 5x7 inch oil painting on gessoed hardboard. Slice up a lime and add it to a bottle of Corona--ahhh, nothing like summer time! 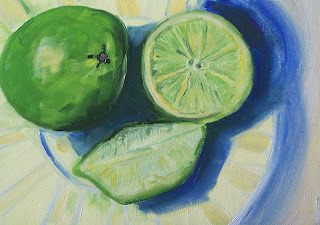 The fresh green of these limes provided inspiration for this little 5x7 inch oil painting. The color and design were fun. Today's 8x10 inch oil painting was the result of a fun little accident. 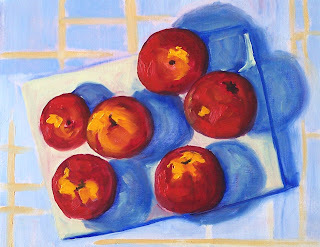 I was going to paint a bowl of these juicy little jems, but I found a rotton nectarine in the bottom of the bowl. Needless to say, I threw away the bad one, washed the bowl, and was ready to put the fruit back in when I noticed the wonderful shadows cast by the sunlight on the nectarines. I left them just as they were, on top of a gessoed hardboard and painted away. I like the bright colors and the contrast of shapes. As I said, a fun little accident. This summer I have been adding a new painting for sale at Etsy every Monday or Tuesday. Since I didn't list a new painting yesterday, here is today's listing. 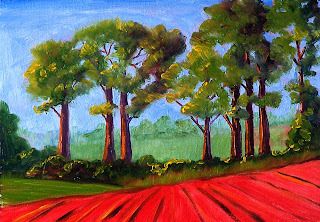 It is a 5x7 inch oil painting inspired by the coolness of a hedge row in summer. A cool escape from the heat of the summer sun is inviting this time of year. You can see some closeup photos or purchased it for $50.00 plus $6.50 shipping to US addresses by clicking here. 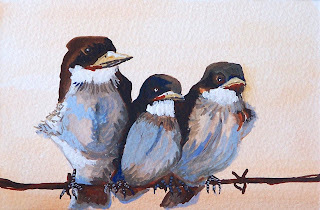 Yesterday I had so much fun painting the little baby birds, that I decided to paint another bird. 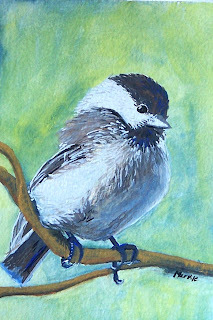 This one is a Chickadee, the kind I love to see fliting about in my backyard. 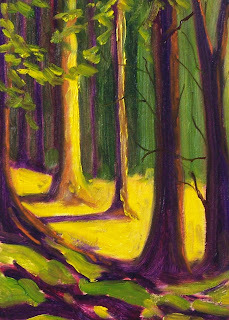 This little painting is gouache (opaque watercolor) 4x6 inches on watercolor paper. My new set of gouache paints and my friend, Carolyn, inspired this little 4x6 inch painting. I love the paints! They allow for subtle variations that I've never been able to achieve with my oils. They can behave like watercolors with lovely transparency, but not require the preservation of whites that I've always found irritating with watercolor paints. A couple of weeks ago Carolyn gave me some magazines that are full of beautiful photos of birds, flowers, gardens, and butterflies. I've never been much for finding inspiration from magazines, but the combination of those magazines with my new paints prompted me to create this little painting. It was delightful sitting in the back yard, enjoying some shade, and painting. This is another reminder of my visit to the Nisqually Wildlife Refuge. This is a view from the Dike Road which is a 5 1/2 mile circle through the refuge and estuary. The morning was cool, but as I ended the loop, the sun came out and sparkled through the trees, leaving shadows on the path. 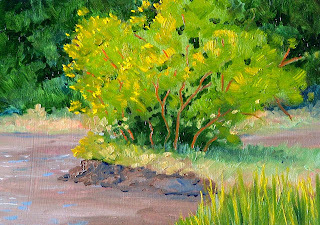 This 5x7 inch oil painting is another inspired by a visit to the Nisqually National Wildlife Refuge. The estuary of which this little clump of trees is part is soon to undergo a restoration. The dike path from which I viewed this will be removed, so I am glad of the visit. Today I went to the Nisqually Wildlife Refuge in Thurston County, Washington State. There are are a log of wetlands, birds, and other wildlife. It is a wonderful place with miles of trails and sites to see. Right outside the Nature Center is a pond that is full of these big green frogs. 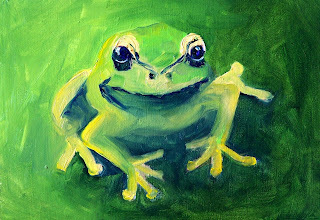 Altough I've not painted many animals, I had to recreate one of these guys with their big eyes and lovely green skin. 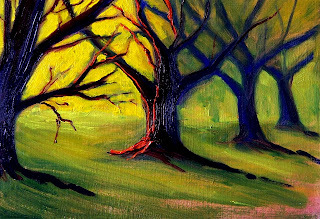 This painting is 5x7 inches and was created using professional grade oil paints. Lush with foliage, vinyards are visually satisfying. 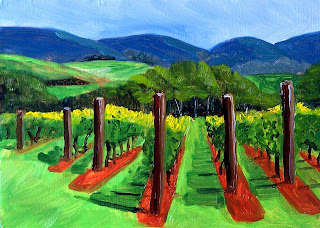 This 5x7 inch oil painting represents some of the wonderful grapes grown in Washington State. The joy of summer time is fast upon me. A walk down a country road--a stroll through the park--I'm enjoying every moment of summer warmth. It is my favorite season and provides me with continuous inspiration. Today's 5x7 inch oil painting is no exception. Long summer evenings are finally here! Such evenings are the inspiration for this 8x10 inch oil painting. I love that golden time just before the sun goes down when the sun is making its last wink through the trees. This painting is for sale in my Etsy shop in celebration of summer evenings. It can be purchased for $125.00 plus $12.00 for shipping to US addresses by clicking here. This morning I completed an interesting value study. A couple of weeks ago I did the first part of this experiement. You can see the previous value study here. 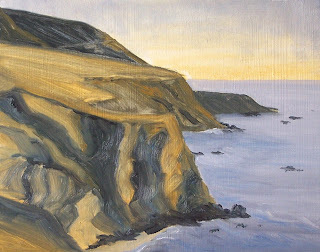 The first study was created using Burnt Sienna, Yellow Ochre, black, and white. It was a wonderful exercise and I was fairly pleased with the results of the limited palette. The second part of the study which I completed today was to use two complimentary colors plus black and white. I chose Yellow Ochre and Cobalt Blue, plus the black and white. I was anxious to add blue since the first effort didn't have any blue. I didn't like the results on this 8x10 oil study nearly as well. Since the original photograph was warm, the coolness of the blue contributed little. Even though I still had Yellow Ochre to warm it up, the range of warmth was significantly reduced. In addition, I missed the transparency of the Burnt Sienna. I kept wanting a red. Yellow Ochre is an opaque color that doesn't provide the glow of a transparent color. This was a good exercise because I had to work on values and concentrate on warm and cool temperatures, but I also learned that the transparency of a color adds an additional complexity that I like. Maybe I'll try this one again in a few weeks with a different set of complimentaries.